It’s just a few days to July, and I’ll be using Camp NaNoWriMo to jump-start a first draft of the sequel to Red Soil Through Our Fingers. Having moved from Boston to a much lower-stress pace of life in Virginia a couple of months ago, I’m now through the post-move transition and ready to draft some fiction again! Incidentally, Camp Nano was what led to the initial draft of Red Soil as well, so it’s fitting that the sequel will begin its life the same way. I’m also excited that several members of my writing group are joining in, plus some friends of ours as well! Yoo Sun-Hee has been left in charge of Hellas-Dao, a Mars colony caught in a power struggle that now ripples across the solar system. Surrounded by enemies and unsure of her allies, she must somehow defend the colony against all comers and navigate a path to freedom. Meanwhile, the thousands of colonists under Sun-Hee’s watch don’t see eye-to-eye on the best course for the future. As governments and mega-corporations battle for supremacy of interplanetary space, those living on the red soil of Mars descend into infighting and faction. A single spark could set off violence that will destroy the colony — or its hopes — from within. How do we construct a functional society from factions that vehemently disagree over fundamental values, to the point of active hatred and violence? Is separation the only/best choice? When loyalty to principle conflicts with loyalty to those we love, how do we decide which takes precedence? If we truly had an opportunity to “reset” a government/society and shed generations of precedent, what would we build? 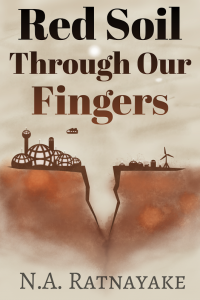 If you still haven’t ever picked up a copy of Book 1, Red Soil Through Our Fingers will be FREE at Smashwords from July 1 to July 31 as part of their annual July Summer/Winter sale.